Pliers. A simple word, a simple concept, but what a deep subject! We all have them, some of us have lots of them. We have them here everywhere you look. One or two in each toolbox, a multi-tool on our belt, hey, isn’t there a pair in the kitchen junk drawer? Well, there should be, but how often do they grow legs and walk away? All the time – because the go-to tool in so many situations is the common, ordinary set. Seems like you can’t have enough around. It’s one of those emergency tools that you want to have in all your vehicles. One of the things we here at Drivrzone love is browsing the clearance bins at the local hardware store. Our day is complete if we can score a nice tool for just a few dollars, pounds, or euros. Another pair is always a welcome addition. Of course, there are many varieties: slip-joint, needle-nose, locking-jaw, diagonal (aka side cutters), and lineman, just to name a few. And there are endless variations of each variety. If you are in the market for some of these tools, we are here to help. We’ve trolled the aisles for the best quality and price we can find for you. Read on for our results as we run down the best options for you. So everyone’s grabbed a pair at one time or another to help with some little chore. We know we need them; but as we build a toolkit in our garage, what should we look for and what do we need? First, you need an assortment of styles. Different styles do different things, and if you match the set you pick up with the task, your day will go much better. For that reason, we are mostly recommending sets. Buy the whole kit, and you’ll have everything right at your fingertips. You don’t want to drop everything and let the job wait while you run out to buy the right tool! For this reason, get a set, you’ll be happy you did. 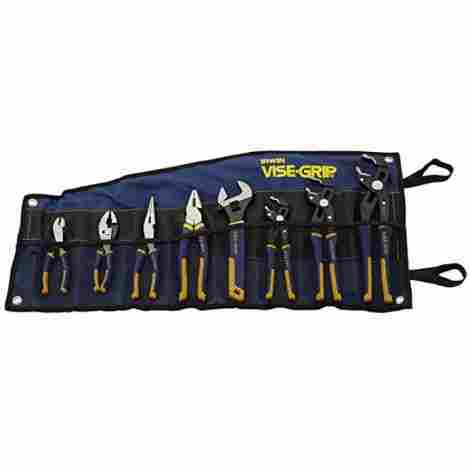 The Irwin Tools 2078712 8 Piece GrooveLock Set is a first-rate set, with 8 tools contained in a neat fabric roll-up organizer. 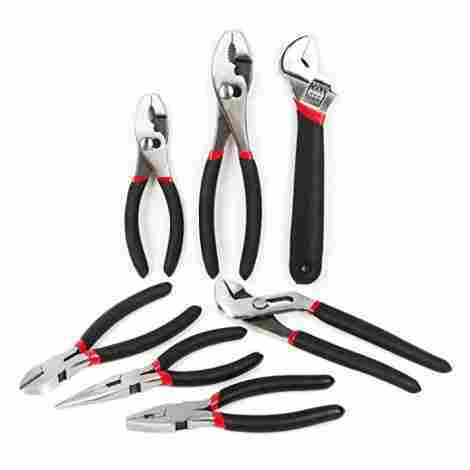 The tools found in this set include three different sizes of groovelock pliers, as well as long nose, linesman's and slip joint options, a diagonal cutter an adjustable wrench. 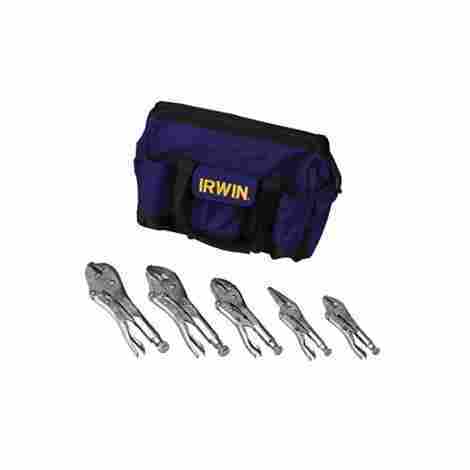 The Irwin 2078712 is an 8-piece set. One piece, the 8-inch adjustable wrench, is not technically a pair of pliers, but it's a nice tool, so we'll take it! The rest of this fine assortment features padded handles in nice colors (nice and bright to help you spot them in the garage! ), and with an anti-pinch system to protect your fingers. The groovelock feature Irwin's Press-n-Slide button system for rapid adjustment to fit your workpiece. The Groovelock use a ratcheting action that allows them to be adjusted from the open position up to the workpiece by simply pushing the handle up, with no need to press the button. If you've ever been working under your car, in a tight space, wishing you had a third hand, you'll understand how nice the ability to adjust them on the fly, one-handed, truly is. We were so impressed that we bumped these straight to our number one! You'll love them too, we're sure. We also loved the all-purpose jaws on the groovelock, which grip easily on round, flat, square and hex shapes. No slips or barked knuckles with these! This not an inexpensive set, but you are getting a lot for your hard-earned money. These tools are backed by the IRWIN lifetime guarantee. The fit and finish are lovely, and the strong chrome vanadium tool-quality steel and heat-treated forged construction will keep them looking good and ready for use for years to come. The Craftsman 009-45235 is a 4-piece set of high-quality tools. This set includes diagonal, long nose, slip joint and arc joint tools, all manufactured from durable heat-treated, forged alloy steel. This high-quality set, under the famous Craftsman name, comes with 4 of the essential needs of any garage. If you have these four in your kit, you have most everything you need in the way of pliers. When you reach in your toolbox, reach for the best: Craftsman. The Craftsman lifetime guarantee is famous and respected among gearheads! These are constructed of strong forged steel, heat-treated for best durability. Like all pliers, they extend your reach and magnify your grip. The long-nose can be used to reach into tight spots to hold a nut or grab a wire. The diagonal easily and accurately cut wire or light material like zip ties. The slip joint are versatile, with serrated jaws for a powerful, non-slip grip and a wire-cutting jaw at the back. While this set is pricier than others, its quality and guarantee place it firmly in the second position on our list. We spend a lot of time with tools, using tools, looking at tools, and shopping for tools here at Drivrzone. We can feel quality when we touch it and know it when we find it. We found it here. We always preach to buy quality when you can afford it. This set is worth it. 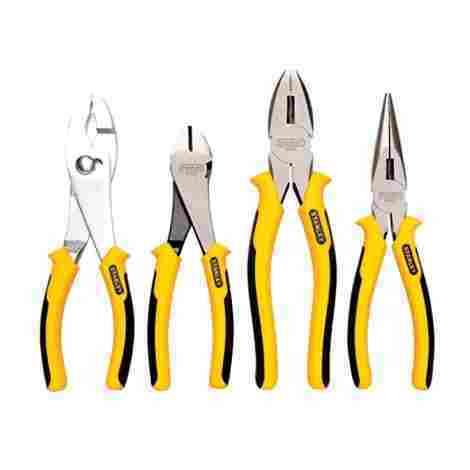 The Stanley 84-058 plier set includes 8-inch slip joint, 7-inch diagonal, .8-inch lineman, and 8-inch long nose, all with attractive, padded black and yellow grips. This set is designed to perform the full range of tasks you'd expect from this type of tool: grasping, bending and cutting. And it will do it all well! The slip-resistant bi-material grips are designed with your comfort in mind. The drop-forged steel is strong and durable, meaning it will last for years and years of regular use. What kind of use, you ask? All those tasks we mention above, and doing it all in the summer heat, winter cold, and everything in between. Made of drop-forged steel alloy, these will last a long time. We've got a bit of tool experience here, and we have had a pair of less-than-good quality pliers bend in our grip while trying to use them. None of us here look a bit like King Kong, so poor quality was the cause. That will not happen with these quality tools! You will not be disappointed with them, and in fact, they will raise the bar in your garage. This array is very affordable, and as such represents a great value. The Stanley name alone is assurance of quality. The materials are good, the tools themselves are attractive, and we'd be proud to own them. Consider that they are a practical and useful toolset, and you'll agree with us that they have earned their spot on our list at third place and the best value! The Channellock Tool Roll contains 5 different tools, including a 10-inch tongue and groove and a 7-inch side cutter. The set is organized in a tool roll nicely crafted of dark blue fabric, with a flap to hold your tools in place. OK, saying "Channellock" when it comes to pliers, especially tongue and groove options, is like saying "Xerox" when you talk about a copier, or "Q-tip" when you want a cotton swab. It's an icon, an institution. So when you go out and buy a set of Channellocks, you can be sure you are getting a tool from a company that mastered the trade long ago and knows what they are doing. They stand behind their tools, as well. All Channellock tools come with a lifetime warranty, and all their tools are 100% guaranteed against breakage and failure. You can't ask for much more than that. Channellock built the first tongue-and-groove tool and is a master of the trade. The other tools are equally lovely. The long nose tool features a crosshatched tooth pattern that provides a reliable grip in all directions, while a slim nose profile provides extra precision. The side cutters have a rounded, streamlined design that's easy on the eye and hand, with a sharp, powerful cutting edge. This a pricier option on our list, but "cheap" and "high-quality" are not often compatible qualities. For top-quality tools manufactured from good tool-quality steel, and with accurately machined surfaces, you will pay, but you will be happy with what you get. Don't be afraid to take the leap to top quality tools. The difference in productivity between poor quality tools and high-quality tools, even in the hands of an amateur mechanic, is high years apart. Make the best use of your time by buying great, long-lasting tools. The SK Tools 17835 set includes five different styles including slip joint and tongue groove options, all packaged in a protective storage pouch. The assortment in this kit gives you maximum flexibility in tackling any task. They are weatherproof and have adjustable handles that allow working in confined spaces. The ideal assortment of joint pliers and cutters meets your needs for a variety of general-use applications. The diagonal option are excellent for wires and cables. Strong metal gripping jaws are designed to hold tightly. These feature cushion grips for comfortable use. These are high strength hand tools which will hold things tightly. A good variety of plier size options gives you the choice to meet project requirements. These are among the more expensive option on our list, but their quality is outstanding. SK tools have a well-earned reputation for excellence. Frankly, their price is all that keeps them out of the number one position. There is no question this a great set of tools and priced accurately. We always advocate buying the very best if you can afford it; you can't go wrong with SK tools. Just don't loan them out, you may never see them again! Everyone loves a well-crafted tool that feels great in your hand! The Tacklife HP1SA comes in a molded plastic case containing five different styles including linemen and groove joint options. The Tacklife HP1SA is a lower-priced option from among the sets reviewed here today. It is still a useable set of tools, and a good assortment, including five different styles. Still made from strong chrome vanadium steel, it will give years of excellent service. The Tacklife set features padded handles in bright orange and black, easy on your hands and easy on your eyes. You'll be happy with the look they give your tool box, with a bright accent that makes them easy to spot. 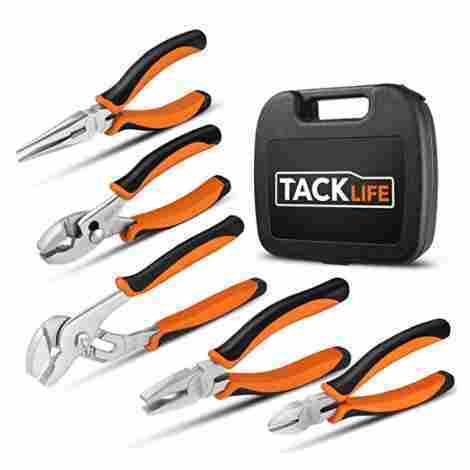 The Tacklife set represents a strong value on our list because of its utility and relatively low cost. You might even buy two for keeping one in the car or kitchen. The included molded plastic case makes it a good option to throw in the trunk for those roadside emergencies. A good contender in the sixth position on our list, Tacklife may belong in your life! This simple set includes 8-inch slip joint, 8-inch long nose, 8-inch lineman, and 7-inch diagonal. This set covers the essentials. This simple set has all you need to take on most tasks requiring this type of tool. 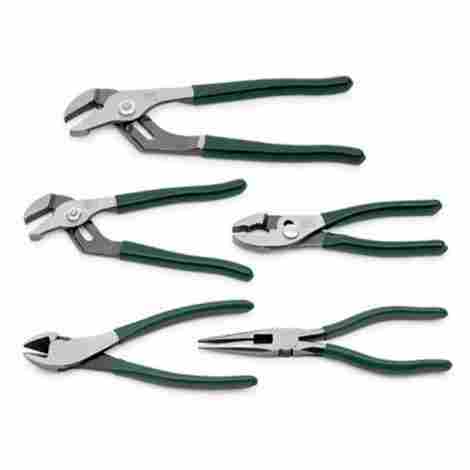 They are made of the same forged steel that most good quality pliers are, able to work year after year. They won't let you down when you need strong gripping or cutting power. These have machined jaws to grip items securely for positive control, and induction-hardened cutting edges for long-lasting reliability. Their non-slip handles ensure a safe, secure grip. All components meet or exceed ANSI specifications. This is one of the least expensive sets on our list and it is a great value for what you get. You'll think you've spent a lot more than you actually have when you lay hands on this attractive set of four. You are buying them for functional, and that's what you get, without fail. This is a unique entry on our list: a single tool, the Crescent PSX200C X2 Long Reach, over 13 inches long, 14.4 ounces of solid steel. Remember early on in the article; we mentioned how we like to browse the clearance tables at the local hardware store? This tool was a find from one of those trips. We bought one just because we liked the look of it, but before long we wondered how we ever got along without it! The double-jointed action lets it reach deep into a tight space to help start a screw or pick up a dropped part. Because it's double jointed, it does not have to open the handles wide to open the jaws fully. It's also much longer than typical needle-nosed options. You may only pull it out of your toolbox occasionally, but when you do, it's a lifesaver! We've used it to pull spark plugs out of a deep hole in a cylinder head, something that couldn't have been done (easily) with fingers or any other tool. It is a great specialty tool for your home or shop kit. This tool is made with good quality steel, and its workmanship is good. It's smooth and easy opening and closing. The handles are padded with good, non-slip material. These will maintain their appearance, utility, and value for years to come. The price-point on these is quite reasonable, probably less than a fast food meal for two. Stay home, have a sandwich, and spend your money on this tool that will make you very happy you did. It's unusual enough to be a conversation piece in your garage. At any rate, it is well worth what you will spend on it. This Irwin Vise-Grip set of locking-jaw pliers includes 10 inch wide and regular models, 7-inch and 5-inch regular, and 6-inch needle nose models. Just as the word "channellock" is synonymous with tongue-and-groove tools, Vise-Grip, an Irwin trade name, is synonymous with locking-jaw pliers. These snap-in position on whatever you want them to hold, and lock in place, hands-free. This is like having a third hand to hold things for you while you work! They ideal for tightening, clamping, twisting and turning anything you can think of. These locking-jaw tools are made of tool-grade steel, heat-treated for toughness and durability. The hardened teeth and jaw tips are designed to grip from many different angles. There are literally millions of these in service today, and they are one of the most durable and sought-after tools today. Irwin Vise-Grip are of a classic, nearly timeless design. This complete set is moderately priced and will be another of the most frequently used tools in your kit. They aren't cheap (nothing this good is), but you'll never regret adding them to your arsenal of tools. When you need one, nothing else will do. The FASTPRO 8-piece utility set includes five different styles of pliers as well as an adjustable wrench so when it comes to your home improvement projects, you are set. Bringing up the rear of our list but not to be discounted is the FASTPRO utility set. 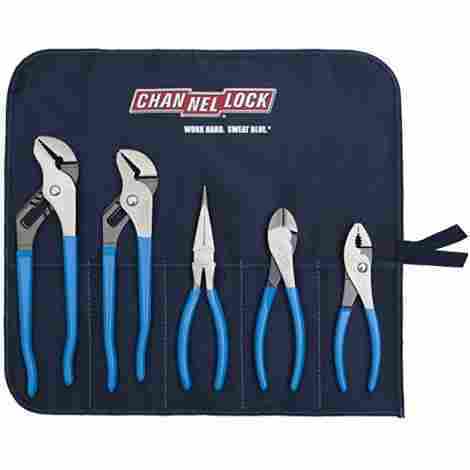 Boasting 8 tools, each of 7 major plier types plus an adjustable wrench, this set is a complete solution for light home use at a reasonable price. The tools have forged-steel construction for durability, machined jaws, and hardened cutting edges. For getting work done on a tight budget, this may be what you need. These are no frill, basic tools that still provide full function. The dipped handles protect both the tool and your hand. If you're looking for best-in-class, look higher on our list, but for get-the-job-done light household duty, this set will serve you very well. This is one of the least expensive choices on our list. It is well worth its price, even if it is not as nice as other, more expensive choices. Sometimes all you need is a quick, easy fix. This may be the answer to that decision. We hope you have learned as much about these toos reading this as we did writing it. If you’re a denizen of the garage, you like using them, looking at them, and reading about them. That’s us; we live and breathe tools. And we love to get others excited about them! In our modern touchscreen world, the ancient mechanical arts do still live on. There’s an elemental pleasure in using your hands to complete even simple tasks. Equip yourself to participate in the world of do-it-yourself mechanics, you’ll never be sorry you did! What your tools are made of is as important as their design. Cheap soft steel will not last as long as the benchmark chrome vanadium steel of a fine tool. Coatings are important as a rust preventative. Never rely on that alone, though, always clean and maintain your tools and store them out of the elements. Just like your dogs, treat them well and they’ll treat you well! All that aside, the materials going into your tools should be of excellent quality. Look for the best you can find. Any tool is only as good as the hand that holds it, but if that hand can’t hold it very long, not much work will get done! Comfort padded grips are almost standard on today’s market. Our aging population benefits from slightly larger grips, making the tool easy to hold. Imagine using a pair for hours on end – not unlikely if you are outside working on a fence. If it’s are steel, it will get a little sore after a while. Not so with the grips on many of the options on our list, which will keep you safe and comfortable for hours on end. OK, your dad still uses the ax that your great-grandpa forged by hand on an anvil in the barn. That doesn’t mean its making life any easier. The state-of-the-art design applies to high-quality hand tools just as it does high-tech electronics. Do you think modern steel might hold an edge better than great-grandpa’s day? You bet it does. Simple touches like comfortable grips found on these, or angulated jaw profiles that hold any shape workpiece securely make today’s tools better and more useful than those from years gone by. Don’t work on your fine automobile with something that looks like it was excavated from pharaoh’s tomb! Look through our list and pick out a set that matches your needs, and enjoy your time in the garage. Unless you’re Bill Gates, you need to watch your budget. And Bill Gates doesn’t buy tools and work on his own cars. You do. The idea is to save money and enjoy yourself working with your hands on vehicle maintenance tasks you can do on your own. To do it you need tools, and the best ones you can afford will let it get done without high frustration. We look at the price/value ratio of hundreds of tools before selecting what we think are the best examples. One factor we look at strongly is the price. We know you want to get the most for your money, and we are happiest when you do! When you drop your hard-earned dollars on tools, you expect to get a wide range of uses out of them. We hope that, too. That’s why we look for sets that include a good range designed for a variety of tasks. You wouldn’t want to blow your whole plier budget on one pair that only does a sixth of what you need. You want to get several tools that will cover you in all situations. When it’s Sunday night, and you need the car running to go to work Monday morning, you don’t want your repair job to come to a shuddering halt because you lack that one needle-nose you need to get that little part in just so. You want to have everything you need right at hand. We want that for you, too. So we look for plier kits that have a high utility factor to apply to all your tasks! How do your tools look? How do they feel? The look and feel can tell you as much about a tool’s quality and desirability as anything. If it looks good and feels good in your hand, it’s probably what you want, no, what you need! Look closely at the photos when you shop online, they can be very revealing. Be discriminating, and you’ll be happy. Some feature large padded grips, other slim plastic-dipped grips, a few are bare steel. Think about your intended uses and your hand size. If you’re older a larger, padded grip might be helpful. If you will be using it all day, nice padding is important. Look at what’s available, and match your use and style to what you see on the market. These tools range from the very large, suitable for repairing your bulldozer, to the very small, good for the watch repair people among us. Fit your size tool to the task. Large or small, each has a place in your toolbox. Valuable toolbox real estate is important if you travel as you can’t take everything with you, so keep it to the essentials and the most useful essentials at that. This is akin to the size question. Huge heavy tools are harder to use for the smaller people in the audience. Smaller, lighter ones may not be tough enough to do the job at hand. If you work on the road, you have to limit what you carry for weight purposes, so consider that in your choices. That said, very generally a heavier tool is a more durable tool. If the metal is just a bit thicker, it is far more resistant to bending or even braking than thinner metal. Finish is important, and many cheaper tools are not as thickly plated as the less expensive ones. Corrosion can set in more easily then. Always treat your tools well, keep them dry, and apply a light coat of oil occasionally to prevent rust. If rust does set in, it can be removed with a wire brush, and the surface carefully oiled to avoid further corrosion. Slip Joint – These are the basic tool you think of immediately. Their pivot point can be moved to increase the size range of their jaws. Usually, there are only two positions, normal and wide. Most slip joints use a mechanism that allows sliding the pivot point from one position to the other when they are fully opened. Tongue and groove – Known colloquially as “channel locks” after the company that first developed them and also called arc-joint. They usually have serrated jaws set 45 to 60 degrees from the handles. The lower jaw can be moved to a number of positions to allow grasping smaller or larger pieces. These will usually have long, 9-1/2 to 12 inch handles for increased leverage. Diagonal – These are actually wire cutters, and would not be used to grasp anything, only to cut. 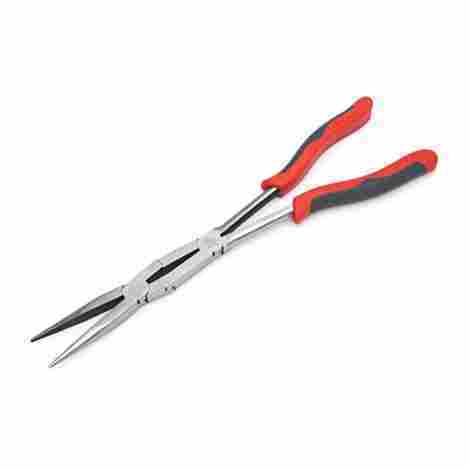 They are also called wire cutters, or diagonal cutting pliers, or diagonal cutters, or side cutters, or dikes. 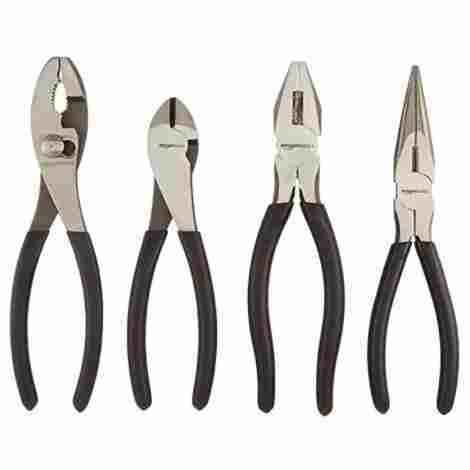 Linemen’s – A heavily built plier with a flat gripping surface at their snub nose. They are designed for use by electricians cutting and pulling heavy wire. They may also be useful for pulling fence wire on the farm or ranch. They usually have a cutting surface inside the jaws. They may also be used for bending or straightening sheet metal. Needle nose – are both cutting and holding pliers used by mechanics, jewelry designers, electricians, network engineers and other tradespeople to bend, move and cut wire. Their namesake long, the slim nose gives fine control while a cutting edge near the’ joint allows trimming and cutting with the same tool. Their long shape makes them useful for reaching into small areas where wires or parts have become stuck and out of reach with fingers or other tools. Bent nose – Like needle nose options but with a pronounced bend, 45 degrees or more, in the jaws. This allows reaching into tighter spaces or around corners. Q: How do I maintain these? A: Like any other quality steel tool. Keep it out of the weather, don’t let it get wet. If you can’t avoid it, dry them off right away, and apply a thin coat of a preservative oil. Lubricate the joint from time to time with light oil. Wipe off dirt or grease that get on them with a soft cloth to keep them ready for the next use, and keep them from transferring grime into your toolbox. Q: Some of these say they meet ANSI standards, what does that mean? A: ANSI is the American National Standards Institute. They publish standards for all kinds of tools and materials. It is an assurance that tool is safe and effective, and made of quality materials. There are many standards for hand tools. The standard level is for tools intended to be used by professional and industrial workers. Meeting the standards is important for companies, as it helps to give them a “seal of approval” for their products. It’s important for you, too, as an assurance you are buying a decent product. Q: Do I really need more than one pair? A: Yes. 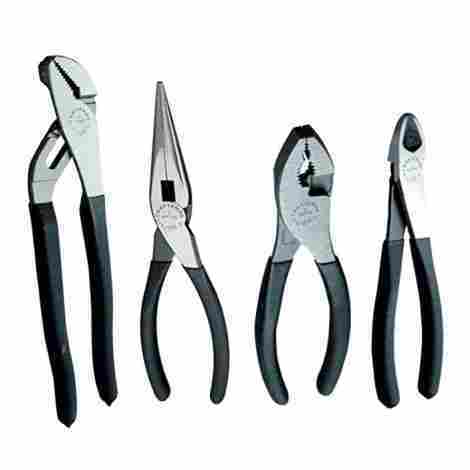 Each plier type has some capability in each range but excels at one or two tasks. Having a variety of them means you’ll always have the one you really need close at hand. That will get the work done with a minimum of skinned knuckles and keep your blood pressure in normal range. It’s one thing to do your own work if you enjoy it, and quite another if it’s sheer torture. Here at Drivrzone we preach having the right tool for the right job, and these tools are no exception. Keep a good selection in your tool kit, and you’ll be a happy mechanic.